While I have seen most of those pics, there are a few that I had not and I thank you for posting the link. I've always found that photo of the windscreen particularly interesting, as it's yet another variation that I've not seen anywhere else. I don't know if all the variations were due to different manufacturers/subcontractors, or what, but it's interesting, to say the least. I had planned on adding the scope's cover and lever system, as shown in the one photo and will certainly be doing so. I just painted the interior of the windscreen and have cut a couple of the window sections to fit. I think I'm going to paint the frame first, then install the glass. 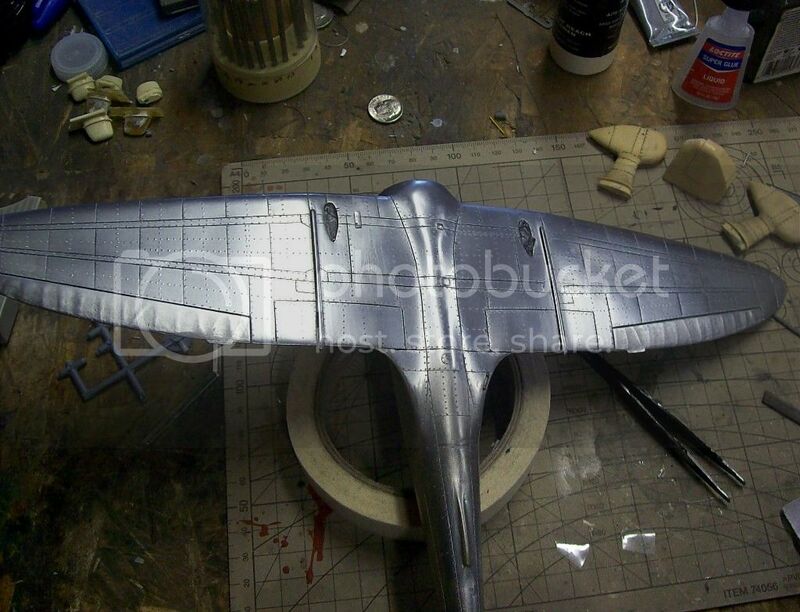 I also painted the underside of the airframe just a few minutes ago. I'll install the mostly painted windscreen after painting the topside and will then have to add a couple more strips of plastic where the two meet, then touch that up, as well. That was the most reasonable plan of action I could come up with, as all the other options had more potential problems with masking and paint overspray/bleeding. We'll see how it goes. Here's my progress for the day! I made the rest of the lights by heating clear sprue and "smashing" it through a teardrop PE template. 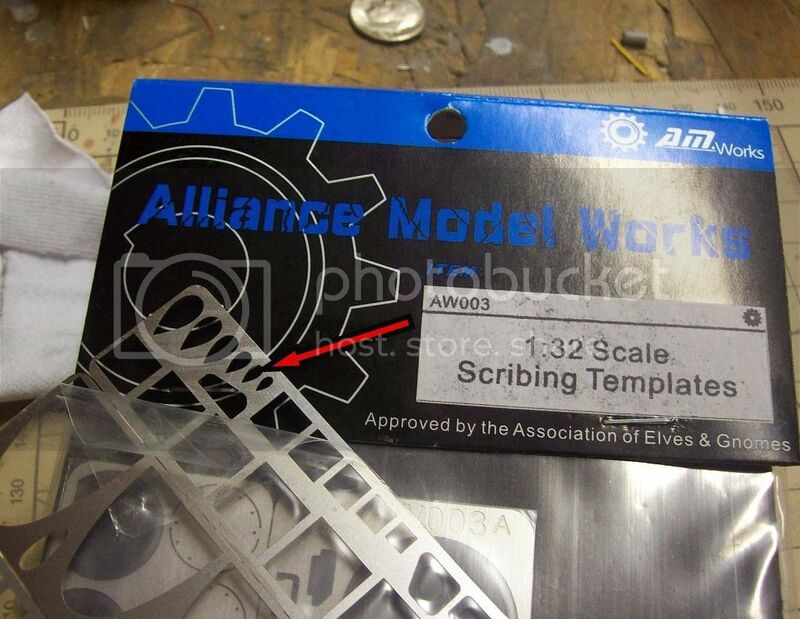 In this case, the 1/32 scribing template set by Alliance Model Works. I painted the underside with Testors Metalizer. I used Stainless Steel, since I was out of aluminum and buffed it. When you apply the sealer, it dulls it quite a bit and you really can't tell the difference between the two colors. After that was dry, I applied the lower decals and gave them a coat of micro-sol. 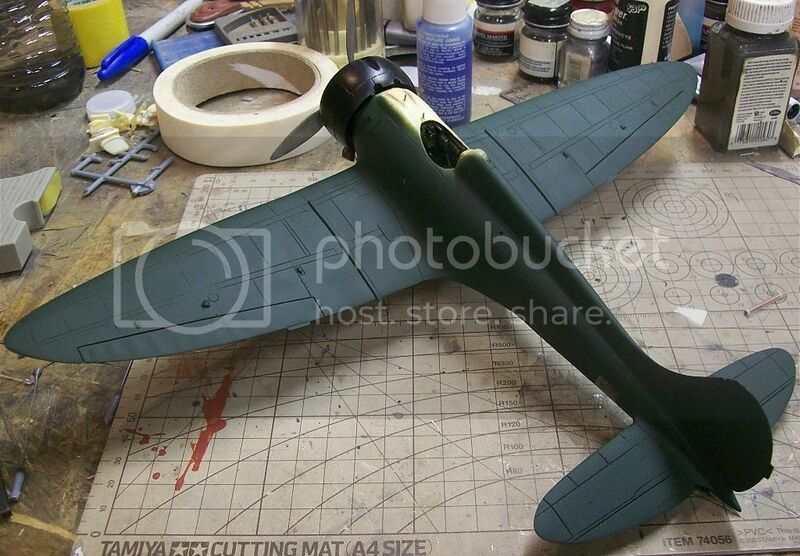 I used decals from the 21st Century A6M2 kit, as they were the size and color that I wanted. Unfortunately, when I sprayed the sealer coat, the decals fractured into a thousand pieces underneath it. After that all cured, I sanded them down the best I could and applied decals that came with this kit. They're a touch lighter in color, but I'll have to live with it. I think the problem was that I didn't let the micro-sol take full effect. I should have waited overnight before applying the sealer, but I got ahead of myself. The new decals are still a little rough, but a huge improvement over the "spiderweb" effect that was there before. 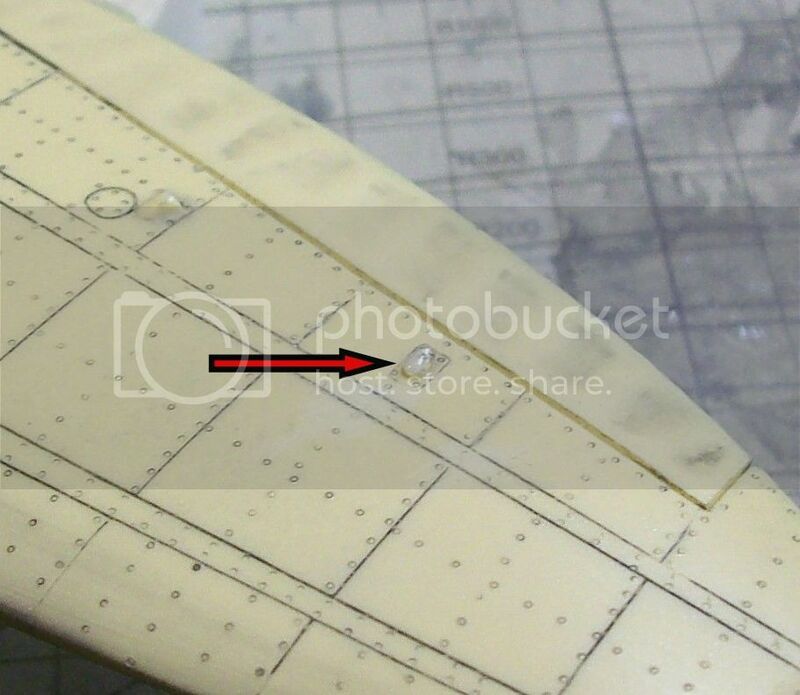 I was worried about the rivets being too pronounced on the underside, also. They actually look pretty good and are not as prominent to the eye as the photos would indicate. I've done most of the preliminary painting. I stopped short of the cockpit area so that I can get the windscreen in place, first. 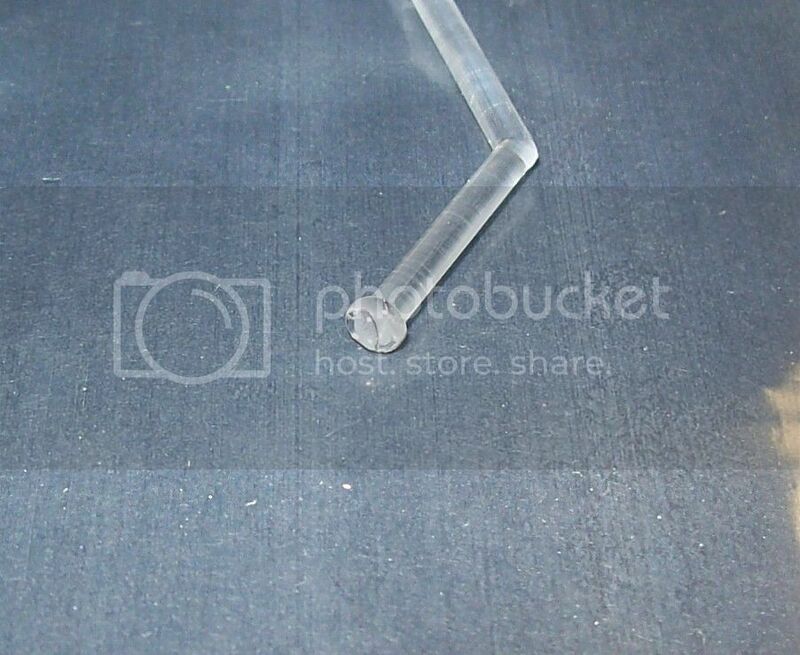 I also noticed runs from the Metalizer sealer that had dripped down on the nose area. I'll have to sand them off before completing the paint work. 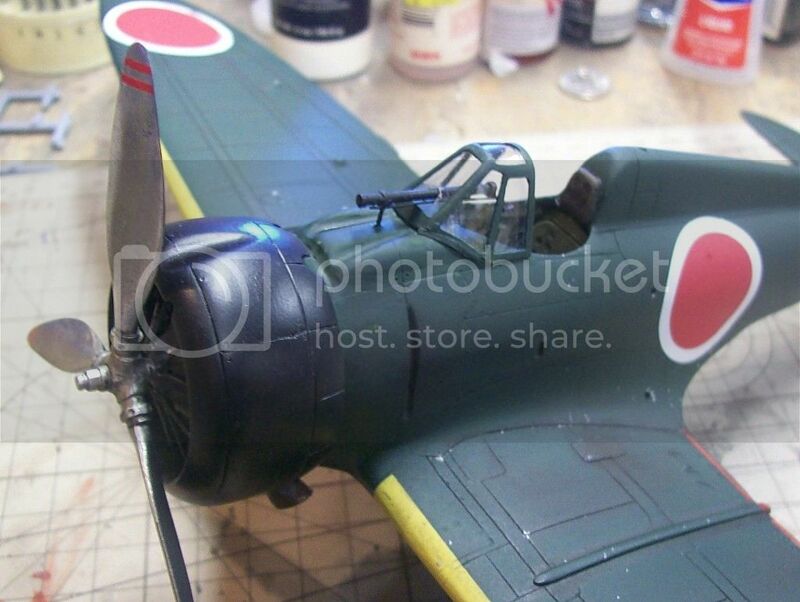 The paint I used was Floquil IJN Green. 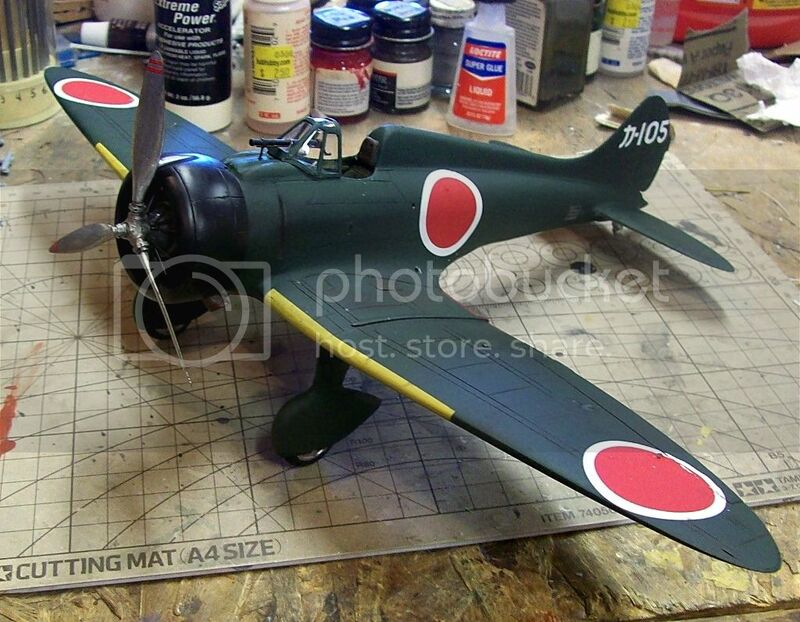 It seems to be darker than most other IJN Greens in my paint drawer and better captures the look of my reference photo, in my opinion. I also did a test fit of the cowl/exhausts again. 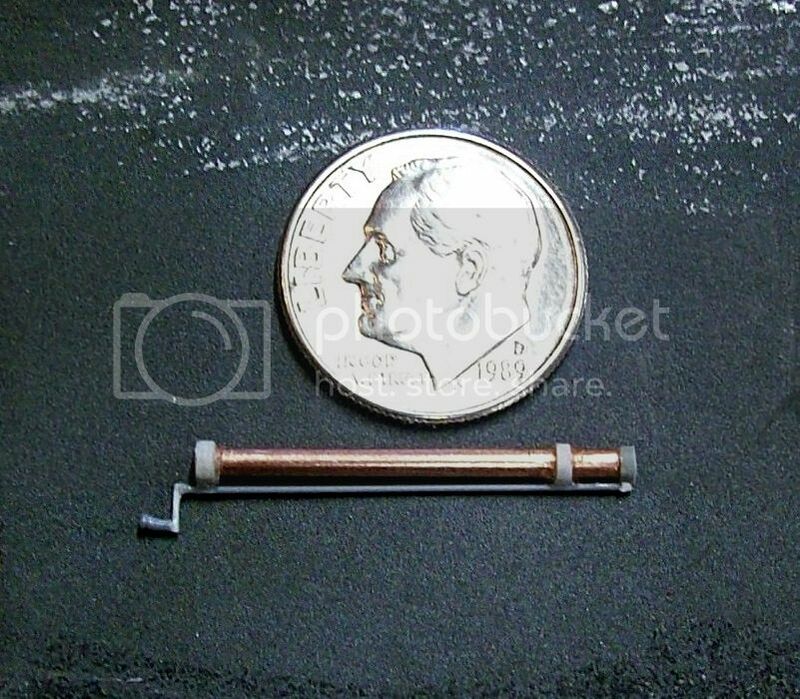 I think I'm going to shorten my spacer just a little bit more, but it's really close to where I want it. I also added a shaft to the prop, so it will actually turn now (but I forgot to take pics). Next, I'll get back to the windscreen. I've added the spindle for the sight's cap, also, but still need to do the handle and cap, itself. I'm almost on the home stretch. I really like the way this is turning out John! Fantastic stuff. Can you tell me where you found this template? With all the re-scribing work I do, I'm a bit of an avid collector of them, and I confess I've never seen this one before. Can you tell me where found this template? With all the re-scribing work I do, I'm a bit of an avid collector of them, and I confess I've never seen this one before. I don't have any of the recent Eduard sets unfortunately Harv; my most recent one probably goes back quite a few years (and I don't have that many anyway). I'm sure I could find a suitable teardrop shape on one of my other sets, but when it comes to scribing templates, you can't have too many! Really liking it John! The color came out great, and the riveting does add a nice extra dimension. Because of your build, I'm probably going to get right to work on my Special Hobby Claude next week, thank you for inspiring me with this one. I don't know if I'll go as far as to rivet it, but I will try and make it look as nice as your build. All of your filling and sanding came out invisible as well, great job! Please, keep up the amazing work. I got the templates directly from Alliance, here: http://www.am-works.com/store/aircraft-scribing-templates-c-3_16.html They also make a nice screw head set that I ordered, among a lot of other cool things that they stock. I only found them by chance. Go for it! This is one subject that we just don't see enough people building, in my opinion. The more, the merrier! My decision to rivet this one was pretty much a spur of the moment thing (was going to do a couple small panels and before I knew it....half a wing! ). I probably won't rivet the next Claude I build, either. It just depends on if I get a "wild hair". 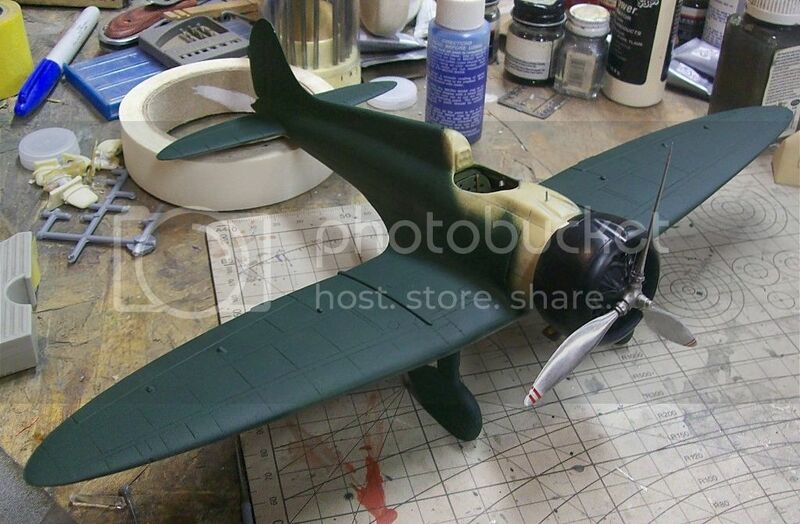 This morning, I did a little more work on the gun sight, as well as painting the yellow ID bands on the wing leading edges and the headrest (but forgot to get pics of those). I also shortened my spacer for the cowl/engine and it should be the proper length, now. I just realized that the crank handle may be in the wrong position for the cap in it's closed state. I'll have to look into that a little closer. Also, I decided to go with a flat cap, as I've never seen the conical style one on any other Claudes, apart from the Russian captured one pictured in the link provided by Doug, above. Again, another variation among many! I made a lot more progress last night and this morning. I got the glass in the windscreen and everthing painted and installed. Main wheels painted and installed, tailwheel installed and decals on. I also did a light wash, just to get some of the rivets on the topside to show. For the windscreen, I did the best I could to get it to fit, but there's still a gap, especially on the right side. It got to the point that I was doing more harm than good by trying to fix it any further, so I stopped. The windscreen assembly is so fragile and I've come this far, so I didn't want to end up starting all over if I were to wreck it. There's still quite a few small parts to add and a lot of touch-up work to do. 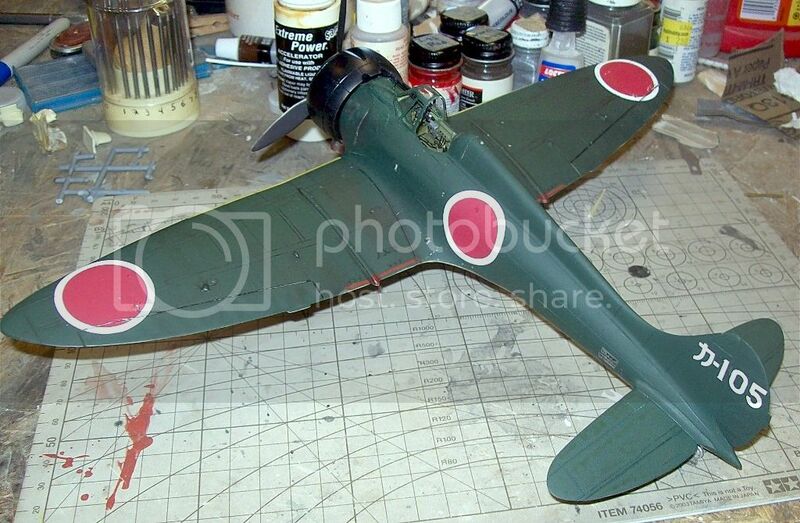 The small stencil decals seemed to be no problem, but the hinomaru were problematic. Not as bad as the underside was, but they still cracked slightly when I applied a flat coat. The areas around the lights, which the wing decals go over, also chipped badly. This model is HEAVY! 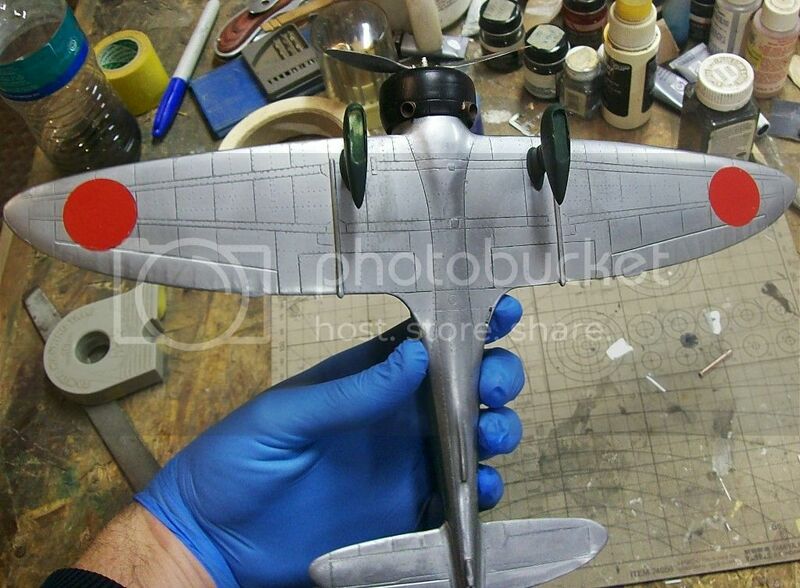 I haven't weighed it, but I'm willing to bet it easily weighs as much as a complete1/48 Monogram B-17, due to the fact that it's almost entirely solid resin! I'll post more pics when I get finished. The Claude looks awesome John, I like the green scheme as most people pick the NM. Very nice work so far! I am currently working on the SH one too! We could almost have our own group build if Matt's doing as well. Very nice build - I'm sure Dave would approve! I am officially done, now. I even went back and fixed the right side of the windscreen that had the big gap (I just need to step away from it for a bit and regain my senses). The windscreen, as a whole, will never be perfect. 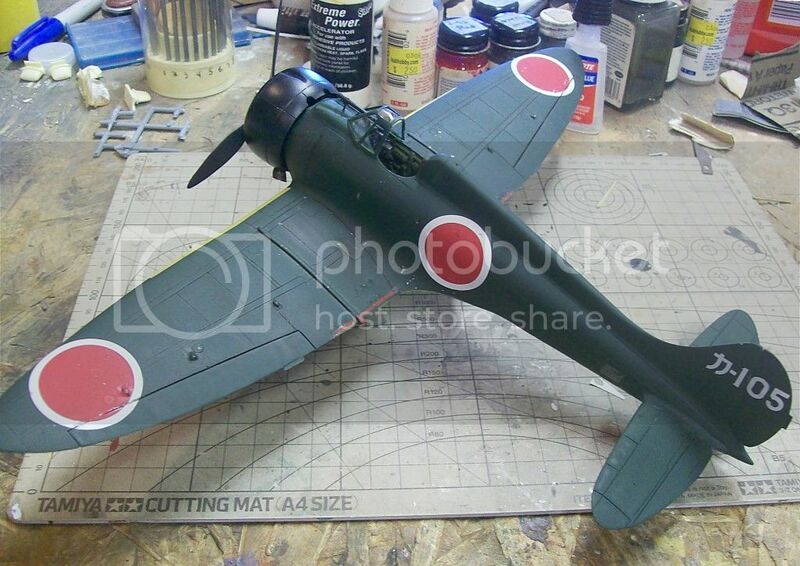 However, it's better than it was, better than what the kit provides on it's own and the process of building it was a positive learning experience. 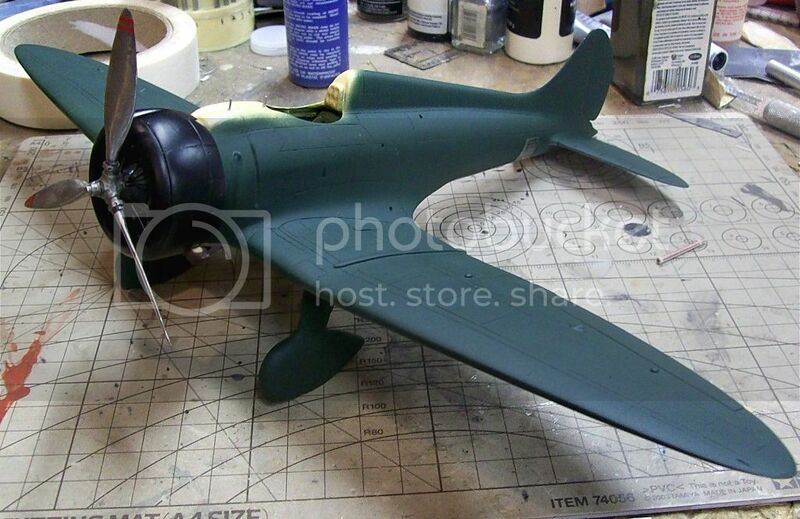 I was hoping to get photos today (My P-36 is now done and awaiting the final photo shoot, as well), but it's bright outside and the wind is howling. Such is life on the wind-swept plains, in "Little House on the Prairie" country. I'll get pics up as soon as I get the chance.